We now offer therapeutic laser treatments and acupuncture -- because pain management doesn't always come in a bottle. Acupuncture & Laser therapy available here! Pain management does not always come in a bottle! Welcome to Tri-State Veterinary Medical Group! 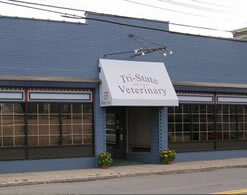 Our goal at Tri-State Veterinary Medical Group is to provide state of the art veterinary medical and surgical services. This will be achieved through the continual education of our staff and of our clients. We value our clients as much as our patients. Our desire is to celebrate the human - animal bond, which brings joy and love into our lives.